Ranking non-English speakers by state, California leads the pack, followed by Texas, New Mexico, New Jersey, Nevada and New York. The study comes amid several reports of altercations over the use of English, such as last week's report about a couple who was refused service at a Florida Taco Bell because they did not have any English speaking employees. In another case last May, a New York man threatened to call immigration police if customers and employees didn't stop speaking English in a restaurant. In contrast to many of the nation's cities, in rural areas outside of metropolitan areas just 8 percent speak a language other than English at home. 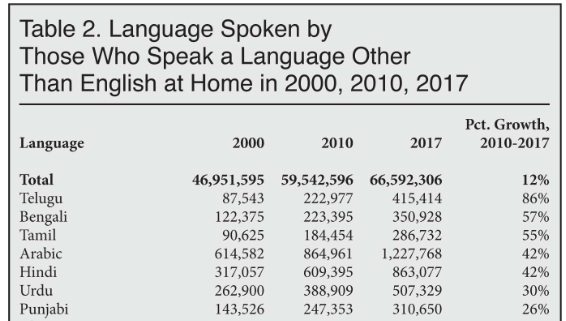 The data released thus far indicates that nationally nearly one in four public school students now speaks a language other than English at home. In California, 44 percent of school-age (5-17) children speak a foreign language at home, and it's roughly one-third in Texas, Nevada, New Jersey, New York, and Florida.